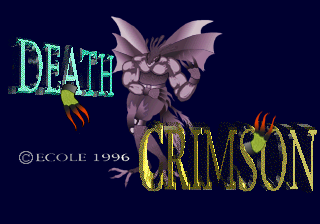 Death Crimson (デスクリムゾン) is a lightgun game for the Sega Saturn. It is often considered to be one of the worst games for the system. It was followed by Death Crimson 2 and Death Crimson OX for the Sega Dreamcast. The Ecole animation logo shown in the game was inspired by a statue from Lake Touya in Hokkaido. 10 years ago, when he was still in the Marumara Army, he and his two buddies Danny and Greg found some ancient ruins. Inside, they found jewels, ancient books, and a gun called Crimson. The three friends grabbed everything they could and escaped back to their homelands. They never met each other again. 1996 — present day: The KOT syndrome has infected all of Europe. Combat Echizen has become a doctor. He found himself dragged by fate into the town of Saronika where all the citizens have become monsters. Without realizing, he started using the Crimson against them and found it quite effective in dealing damage. The Crimson could also upgrade itself in the midst of battle too. Realizing this gun is connected to the KOT syndrome and the appearance of the monsters, Combat Echizen goes to Limburg University, Coneraato Bridge, Izgit River, and finally to Asshimu Mansion to fight the monsters and reach out to the truth. The game was panned for its terrible graphics, non intuitive calibration screen (it fades to black after you shoot the target and you can’t verify if the gun is calibrated correctly), for the disorienting camera movement and the terrible hit detection. It became considered as "Densetsu no Kusoge" by various retrogamers. Main article: Death Crimson/Magazine articles.